An excellent low-latency plug-in limiter that does far more than its name implies. Transparent peak stop limiter. Saturation process that increases perceived loudness levels. Moves from subtle enhancement to extreme manipulations with ease. 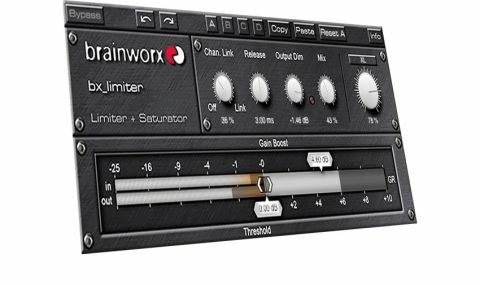 When Brainworx brought out its mastering limiter, the bx_XL, it impressed a lot of people, including us. The XL saturation process and the peak stop limiter in the XL have been combined in the brainworx_limiter to give us a more straightforward and CPU-friendly variant that can be used on multiple sources in a mix. "The idea of saturation in a limiter may seem a little odd, but the XL circuit has a very clever algorithm"
When using multiple busses for different instrument groups which then sum to a master bus, it's easy to get peaks on individual busses that force you to pull back your overall level to prevent overloads. Often these peaks can be very large, so the resultant overall volume loss is big. If peaks coincide, then resultant master level is further compromised and can cause other issues. If you're using master compression on your final stereo buss those peaks can pull at the compressor and cause some nasty pumping moments, so you have to use less overall compression than you want for the sound you are chasing. A simple peak stop limiter on a troublesome bus or individual track will save the day, and that is exactly what you get here. Let's look at some of the limiter controls, starting with the row of knobs at the top. First up is the Chan(nel) Link. On stereo sources this controls how linked the limiting is. At 100% it's like any normal linking switch, and as you back it off so the L and R of the stereo gain independence from each other. Very useful, particularly on pianos and drums where you want to let the individual sides 'breathe' a bit. Release and Output Dim are pretty self explanatory as is the Mix function. The reason for an output dim is just that should you be hitting 0dB, but then want to EQ after limiting, you can pull back the overall level to give the EQ some headroom. The idea of saturation in a limiter may seem a little odd, but the XL circuit has a very clever algorithm that subtly does a lot to help perceived loudness. Perversely, it has the habit of adding clarity to the high-end of sources and can be quite a 'sound saver' in certain situations. That said, you can crank it up for some pretty dirty sounding results, particularly when you dial-in some extreme limiting. These effects can also be blended with the mix control to add some colour and punch. The bx_limiter is a very useful tool. As a peak stop limiter it sounds great because it has no sound - it just knocks off the peaks as you want them. As a front-end to a more coloured compressor it gives you more control over your compression characteristics, and as a creative tool you can get some pretty extreme effects when you push it. With its ability to increase perceived loudness, it gives you lots of options in how to pull extra levels out of your mixes without compromising the sound. So, yet another great Brainworx tool, and at a good price too.